Mars InSight team members monitor the status of the lander prior to it touching down on Mars, Monday, Nov. 26, 2018 inside the Mission Support Area at NASA's Jet Propulsion Laboratory in Pasadena, California. InSight, short for Interior Exploration using Seismic Investigations, Geodesy and Heat Transport, is a Mars lander designed to study the "inner space" of Mars: its crust, mantle, and core. Mars InSight team members monitor the status of the lander prior to it touching down on Mars, Monday, Nov. 26, 2018 inside the Mission Support Area at NASA's Jet Propulsion Laboratory in Pasadena, California. 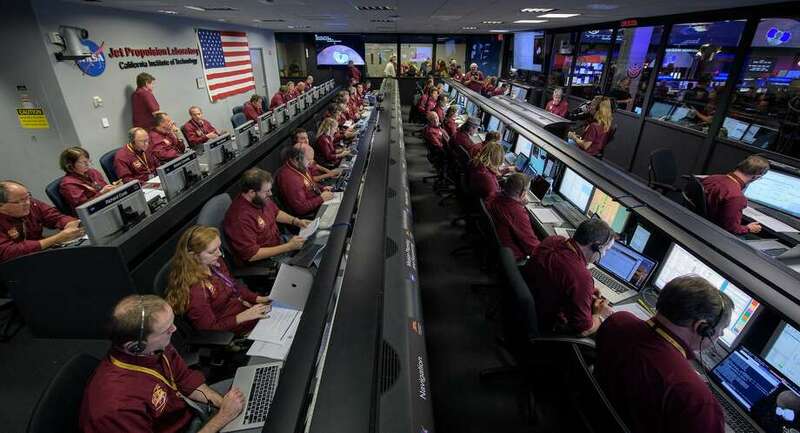 Kyle Cloutier held her breath last week as she watched the InSight probe’s descent to the surface of Mars — hurtling from about 12,000 miles per hour 75 miles above the planet to 5 miles an hour as it touched down. InSight is the first probe that will explore the interior of the red planet to help scientists learn more about how rocky planets are formed. “It’s really exciting,” Cloutier said. As a planning and sequencing engineer with the Jet Propulsion Laboratory, she is responsible for developing, building and testing the commands that are sent to the spacecraft. Since the historic landing on Nov. 26, she and her colleagues have sent daily programs up to the lander to complete tasks, including taking pictures, setting the instruments up and unfurling the solar arrays. She will discuss the InSight project and Mars at the Second Saturday program this weekend at the John J. McCarthy Observatory, just behind New Milford High School. The program runs from 7 to 9 p.m. on Saturday. Cloutier credits her time at the observatory for her interest in space and her career. InSight is the first interplanetary mission to launch from the west coast. The mission also included two briefcase-sized spacecraft, called CubeSats, that had experimental radios and antennas, providing an alternate way for engineers to monitor the landing. This is the furthest these types of crafts have gone before. Most noteworthy though, are the SEIS seismometer that listens to the pulse of Mars, the heat flow probe to get its temperature and two radio antennas to track how the planet wobbles as it rotates around its axis. It’s a feat in itself to land on Mars. This was only the eighth successful landing, after 10 crashes. Leading up to the landing, Cloutier and her colleagues took turns at work to ensure someone was there at all time. In the week after, they modified their schedule, mostly working nights as the data was sent back from InSight, getting about an hour later each day because a Mars sol is about 40 minutes longer than an Earth day. Since the landing, Cloutier said there have been some surprises. Mars was dustier than expected but she said the gravity and wind will remove the dust from the cameras soon. They were also surprised to see so many rocks in the distance of the landing site. Cloutier joined the InSight team in September 2017, just as her last project, Cassini, ended with a fiery swan dive into Saturn. The Cassini spacecraft had spent years capturing images and helping researchers study Saturn and its moons. Though Saturn has captivated Cloutier, she said it was nice to return to Mars. She started working on the Mars rover Opportunity in 2014 as an intern while studying aerospace engineering at the University of Maryland, which then turned into a full-time job. Her father, Bill Cloutier, watched the Insight landing on the big screen at work, providing some commentary to his co-workers about the steps taken to get to that point. He said it’s always exciting to watch a landing on another planet, but he had more of a connection to this one beyond his passion for space exploration. “Having someone in the control room is special,” he said. Bill Cloutier has been following this mission as close as he can, chatting about it with his daughter. He even went out to California for the launch in May, standing in an artichoke field at 4 a.m. just as the sea fog rolled in blocking his view. “We didn’t see anything, but we certainly felt it,” he said, adding the launch was so loud it set off car alarms. Kyle Cloutier will be with InSight until about March and then she’ll move on to a new project. “There’s always new and exciting missions at JPL,” she said.